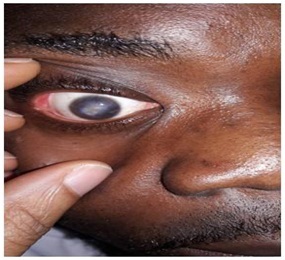 Ocular complications of chicken pox in adults are uncommon and none has been reported in Nigeria. This study aims to report ocular complications of chicken pox infection in 4 Nigerian adults in Port Harcourt. We report 4 cases of eye complication following chicken pox infection. The complications ranged from adherent corneal/conjunctival yellowish membrane, corneal melting, suppurative keratitis, ocular cranial nerve palsy and central corneal scar. 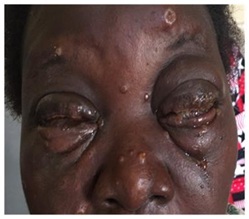 All patients had had chickenpox infection between one to three weeks before onset of ocular complications. These were the first cases of eye complications following chickenpox seen at our Eye facility. The family practitioner and other medical doctors who are likely to see and treat these patients should be well aware of these possible complications so as to refer in a timely manner. The need for more vigilance when managing these patients cannot be overemphasized as the ocular complications can lead to irreversible visual loss with its attendant negative impact on the individual’s quality of life. Chickenpox (varicella) is a highly contagious disease (an infection rate of 90% in close contacts) caused by the initial infection with varicella zoster virus . It is a common viral infection in childhood and results in a characteristic skin rash that heals with scab formation. Even though it is a more severe disease in adults than in children, disciform keratitis was reported in four children following chicken pox infection . In temperate countries, chickenpox is primarily a disease of children, with most cases occurring during the winter and spring months. The highest prevalence is seen in the 4-10 year-old age group. In the tropics however, chickenpox is a disease of adults who are at a higher risk of severe infection. Ocular complications associated with varicella infection vary greatly and may involve any part of the eye from the conjunctiva to the optic nerve. Data on ocular involvement associated with varicella in adults are scarce, and most publications consist of single case reports or case series [3-7]. Complications are also common in infants, pregnant women and immune-compromised individuals, such as those with HIV [8,9]. We present here eye complications of chickenpox in 4 Nigerian adults who were otherwise healthy before the infection. We are reporting these cases because even though epidemics of chicken pox had occurred in the past in Port Harcourt, to the best of our knowledge, this is the first time patients would be presenting with potentially blinding complications following chickenpox infection. 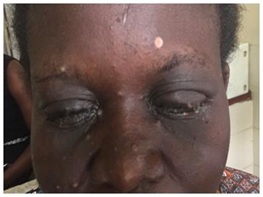 A 45-year old secondary school teacher presented at our clinic in February 2018 on account of a 4-day history of redness, pain, purulent discharge, severe eyelid swelling, inability to open the eyes and diminution of vision in both eyes. She had been diagnosed with chicken pox (A diagnosis of chickenpox was made based on it being an acute illness with diffuse maculo-papulovesicular rash, without other apparent cause) about 4 days prior to onset of ocular symptoms. Patient had nursed her adult daughter who had chicken pox about one week prior to her developing the disease. At presentation, the patient was very ill looking, with multiple maculo-papulovesicular rashes all over the body and face. There was severe eyelid edema, conjunctiva injection, and an adherent yellowish membrane over the palpebral and bulbar conjunctiva. The cornea was also completely covered by this membrane, which could neither be washed off nor peeled off with forceps. There was also severe conjunctival Chemosis (Figures 1 and 2). Her presenting visual acuity in the right eye was Counting Fingers (CF) and the left eye Light Perception (LP). The membrane was so adherent that it was difficult to part the eyelids in both eyes. Corneal staining with fluorescein dye and slit-lamp examination showed evidence of dry eye worse in the left eye Tear Breakup Time (TBUT) = 5secs in the Right Eye (RE) and 3secs in the Left Eye (LE). Other ocular examinations could not be done because of the adherent membrane that almost completely covered the entire corneal surface (Figures 1 and 2). 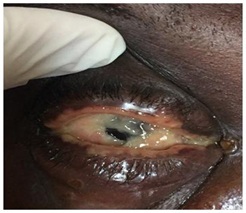 The patient was treated with topical Ciloxan 0.3%, topical 2.5% Povidone iodine, Voltaren eye drops 0.1%, Chloramphenicol ointment 1% and Tear Naturale; in addition systemic Zovirax (800mg orally 5 times daily for 7 days) was commenced. Investigations done including Complete Blood Count (CBC), Fasting Blood Sugar (FBS) and retroviral screening were all within normal limits. On follow up one week later, the patient reported that something fell off her eyes; the lid edema was less, part of the cornea was now easily visible though still very dry (TBUT-RE=5secs; LE=3secs) and there was evidence of central corneal thinning with imminent perforation in the left eye. The right eye was better and visual acuity improved to 6/24 (Figures 3-5). As a result of the corneal thinning, bandage contact lens was inserted but kept falling off because by now the patient had developed symblepharon. She was however lost to follow up after 4 weeks of treatment. A 36-year old male patient presented at our clinic in May 2018 on account of redness, poor vision and swelling of the left eye of 3 months duration. Patient had had chicken pox about one week prior to onset of eye symptoms, which were initially redness, tearing, itching, photophobia and foreign body sensation. 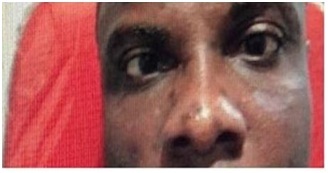 He claimed his vision in the left eye was initially good but worsened over time. Before presentation at our clinic, he had been managed in a peripheral clinic without improvement. The patient however denied any history of use of Traditional Eye Medication (TEM). At presentation, visual acuity in the right eye was 6/5 while that of the left eye was Count Fingers (CF) @ 3M. On slit lamp examination of the left eye, there was diffuse conjunctival injection, a paracentral corneal ulcer with stromal infiltrates, inferior pannus and a 5% hypopyon (Figure 6). There was anterior chamber flare and cells. The pupil was active but there was lens opacity so fundal details could not be assessed. The right eye was normal. A diagnosis of left suppurative keratitis was made and patient was commenced on topical fortified Ceftazidime 5%, fortified Gentamicin 1.4%, guttae 2% atropine, guttae voltaren 0.1%, tabs Diamox and Chloramphenicol ointment 1%. Systemic Zovirax was not given because the infection had run its course by the time the patient presented to us. Investigations done including CBC and FBS were within normal limits. Patient has however been lost to follow up when we insisted on knowing his retroviral status. A 40-year old male patient presented at our clinic in May 2018 on account of sudden onset inward deviation of the right eye of 3 weeks duration. This was associated with binocular diplopia. Patient had had chickenpox two weeks prior to onset of eye symptoms. Patient was not a known diabetic or hypertensive and had been in otherwise good health until the chickenpox infection. He denied any history of trauma. At presentation, we found a young adult in obvious distress, intermittently shutting one eye to avoid diplopia. The visual acuity in both eyes was 6/5. In the RE, there was a 15° (30 prism diopters) esotropia, right abduction deficit and horizontal diplopia in all positions of gaze (Figures 7 & 8). The cornea was clear, pupils round, equal, reactive to both light and accommodation, but there was early lens opacity in the left eye. The Vertical Cup Disc Ratio (VCDR) was 0.7 in both eyes with an Intraocular Pressure (IOP) of 17mmHg and 18mmHg in the right and left eyes respectively. A diagnosis of left 6th Cranial nerve palsy was made and some investigations were ordered including CBC + Erythrocyte Sedimentation Rate (ESR), FBS, Venereal Disease Research Laboratory (VDRL), and retroviral screening; all investigation results were within normal limits; a Magnetic Resonance Imaging (MRI) of the brain and orbit was also normal. Patching of one eye was recommended and patient started on a course of systemic Zovirax (800mg orally 5 times daily for 7 days) to be seen 4 weeks later for follow up. He was also counseled that it would eventually resolve spontaneously. When the patient was seen about 5 months after the initial presentation, all symptoms had completely resolved. PA is 23 year male undergraduate student referred to our facility in August, 2017 on account of right eyelid swelling associated with redness, sandy sensation, dragging sensation and blurred vision for 3 weeks. 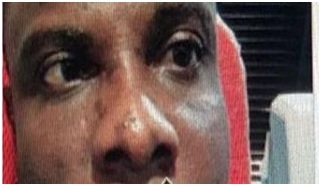 He had been diagnosed with chicken pox in a private clinic about 3 weeks prior to presentation of ocular symptoms. He was not a known diabetic and did not have any other systemic illness. The patient denied any history of use of TEM. At presentation, he had severe photophobia and visual acuity was CF @ 1M in the Right Eye and 6/36 in the Left Eye. There was right eyelid edema, conjunctival injection, a central corneal ulcer and small non-reactive pupil. There was no view of the fundus. A diagnosis of right corneal ulcer 2° to varicella virus infection was made. The LE was normal. He was commenced on subconjunctival genticin 40mg stat, topical Ciloxan 0.3%, Mydriacyl 1% and Chloramphenicol ointment 1% at night. The patient also had systemic Vitamin A. Timolol 0.5% was added when he developed elevated IOP (26mmHg) on follow-up visit. The FBC and FBS were within normal limits. He was retroviral negative. Patient was however not very compliant with treatment mainly because of financial constraints. Zovirax ointment 5% and Ketoconazole tablets were added to the treatment about 2 months after initial presentation since there was no resolution of the ulcer. He also had bandage contact lens insertion. The ulcer finally healed with pannus about 5 months after he first presented (Figure 9). Patient gave a history of corneal ulcer in his 12-year old sister following mumps infection about the same time he had the chickenpox infection. There have been many isolated case reports of eye complications of chickenpox in the literature [1-5]. Ocular complications of chicken pox have been known to affect any part of the eye. In a case- series involving 5 patients, Gargouri, et al., reported anterior Uveitis in four patients, geographic keratitis in one patient and acute retinal necrosis in one patient . All patients had chickenpox three weeks prior to onset of eye symptoms except the patient with geographic keratitis who had the infection one week before eye symptoms. In this study, only one patient was immunocompromised as there was a history of kidney transplant. In our case, one patient had suppurative keratitis following chickenpox infection. This patient presented 3 months after the initial symptoms were noticed. He stated that the eye symptoms were noticed one week following eruption of the chickenpox rash. 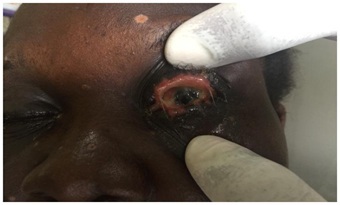 The patient had been on unknown eye drops before presentation at the Eye Clinic of our facility. This may have contributed to the severity of the corneal ulcer and the difficulty in healing especially if topical steroid was part of the eye drops he had used previously. Corneal involvement in chickenpox has been reported as far back as 1905, 1936, 1943 and 1945 in the literature . This same patient initially had symptoms suggestive of anterior Uveitis agreeing with other studies where anterior Uveitis was reported as the most common ocular complication of chicken pox . Similar to our second patient who developed diplopia and right lateral rectus palsy one week after the chickenpox infection, external ophthalmoplegia was reported as a complication of chicken pox in a 48-year old man; who was also found to have orbital myositis and left lateral rectus palsy . It has been postulated that extra-ocular palsies are due to perivasculitis and myositis rather than a neural origin and that muscle ischemia remains a strong possibility, as well as a combination of cortical nerve and muscle inflammation. Therefore, isolated abducens nerve palsy might be caused by circumscribed orbital myositis or a lymphocytic cranial motor neuropathy . Our patient’s orbital MRI did not show any evidence of myositis so the palsy may be in keeping with the perivasculitis and muscle ischemia. There has also been a report of internal ophthalmoplegia following chicken pox infection in a 10year old child. This patient in addition had Uveitis and interstitial keratitis . Other complications reported in the literature include chorioretinitis . Ocular damage may result from various mechanisms - direct result of cellular infiltration or indirect by denervation and ischemia induced by vasculitis; or direct viral replication or from an immune reaction to the systemic viral infection [4,12]. These were the first cases of eye complications following chickenpox that were seen at our Eye Clinic. The family practitioner and other medical doctors who are likely to treat these patients should be armed with this knowledge so that there can be timely referral to the ophthalmologist. More vigilance is also required when managing these patients because the eye complications could lead to irreversible visual loss with its attendant negative impact on the individual’s quality of life. Matsuo T, Koyama M, Matsuo N (1990) Acute retinal necrosis as a novel complication of chickenpox in adults. Br J Ophthalmol 74: 443-444. Martinez J, Lagoutte F, Gauthier L (1992) [Post-varicella disciform keratitis]. J Fr Ophtalmol 15: 597-600. Gargouri S, Khochtali S, Zina S, Khairallah M, Zone-Abid I, et al. (2016) Ocular involvement associated with varicella in adults. J Ophthalmic Inflamm Infec 6: 47. De Castro LEF, Al Sarraf O, Hawthorne KM, Solomon KD, Vroman DT (2006) Ocular manifestations after primary varicella infection. Cornea 25: 866-867. Kelly SP, Rosenthal AR (1990) Chickenpox chorioretinitis. Br J Ophthalmol 74: 698-699. Kim JH, Lee SJ, Kim M (2014) External ophthalmoplegia with orbital myositis in an adult patient after chickenpox infection. BMJ Case Rep.
Farooqui AA, Tahir M, Jaiswal A, Usmani N, Sinha S (2009) Oculomotor palsy following varicella in an immunocompetent adult. South Med J 102: 445. Heininger U, Seward JF (2006) Varicella. Lancet 368: 1365-1376.
WHO (2014) Varicella and herpes zoster vaccines: WHO position paper, June 2014. Wkly Epidemiol Rec 89: 265-287. Falls HF, Beall JG (1945) Ocular varicella - Report of a case of corneal phlyctenule Arch Ophthalmol 34: 411. Shin MK, Choi CP, Lee MY (2007) A case of herpes zoster with abducens palsy. J Korean Med Sci 22: 905-907. Kanski JJ (2006) Clinical Ophthalmology. A systemic approach (5thedn). Butterworth-Heinemann, London, UK. Pg no: 111-114. Ostler HB, Thygeson P (1976) The ocular manifestations of herpes zoster, varicella, infectious mononucleosis, and cytomegalovirus disease. Surv Ophthalmol 21: 148-159. Pavan-Langston D (1975) Varicella-Zoster ophthalmicus. Int Ophthalmol Clin 15: 171-185. Figure 1: Chickenpox rash on the face. Figure 2: Adherent membrane on cornea/conjunctiva. Figure 3: Same patient 1 week later. Figure 5: LE showing corneal thinning & anterior staphyloma. 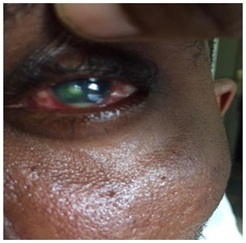 Figure 6: Left Corneal ulcer with stromal infiltrates and hypopyon. Figure 7: Chickenpox scars on the face; RT esotropia. Figure 9: Facial scars of chickenpox and corneal ulcer with pannus. Citation: Pedro-Egbe CN, Chukwuka IO, Fiebai B, Cookey SAH, Abiori S, et al. 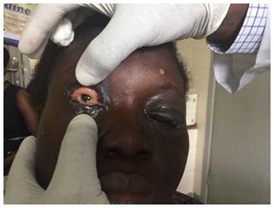 (2019) Eye Complications of Chicken Pox in Port Harcourt Nigeria: Report of 4 Cases. J Ophthalmic Clin Res 6: 047. Copyright: © 2019 Pedro-Egbe CN, et al. This is an open-access article distributed under the terms of the Creative Commons Attribution License, which permits unrestricted use, distribution, and reproduction in any medium, provided the original author and source are credited.